Embroidered chalice covers (veils) - Balaam (red/gold) - Istok Church Supplies Corp. 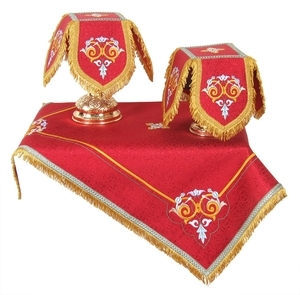 Excellent embroidered chalice covers and veil. Metallic brocade, German threads. By default, these veils are made for 0.25-0.5 L chalice. If you need this set made in different size, please let us know.